Heavy-duty 6mm 100% stretch cord. UV protected - resists fading. Heavy-duty 4x4 roof rack nets with patented spider web design are ultra strong and with two sizes available, will fit most roof racks. 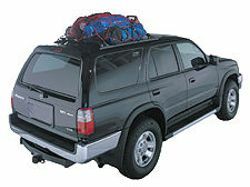 Not just ideal for roof racks, but pack racks too. Use also as a cargo net to tie down your off-road gear in your Jeep. 30" x 40" to 40" x 50" dimension. or 40" x 50" to 45" x 72" dimension. .
Total . $39.99 . $44.99 . Heavy-duty 5mm 100% stretch cord. UV protected - resists fading. . 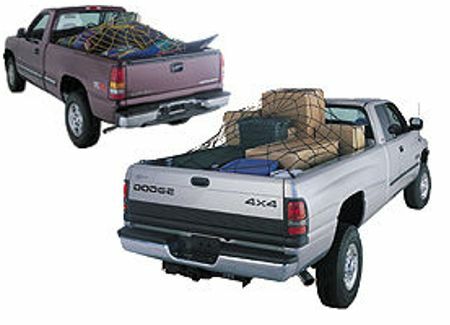 Heavy-duty pick-up bed nets are ultra strong and with two sizes available, will fit most domestic and import pick-up trucks. Medium: 36" x 60" non-stretched dimension. Large: 72" x 96" non-stretched dimension. Total . $39.99 . $49.99 .